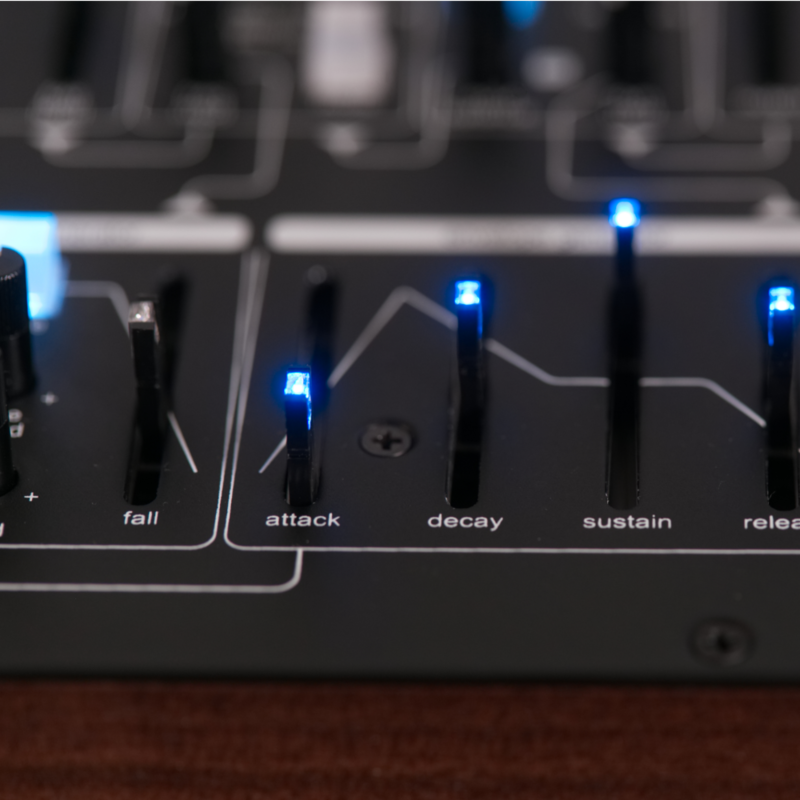 A modern, semi-modular synthesizer inspired by the instruments designed by our heroes. 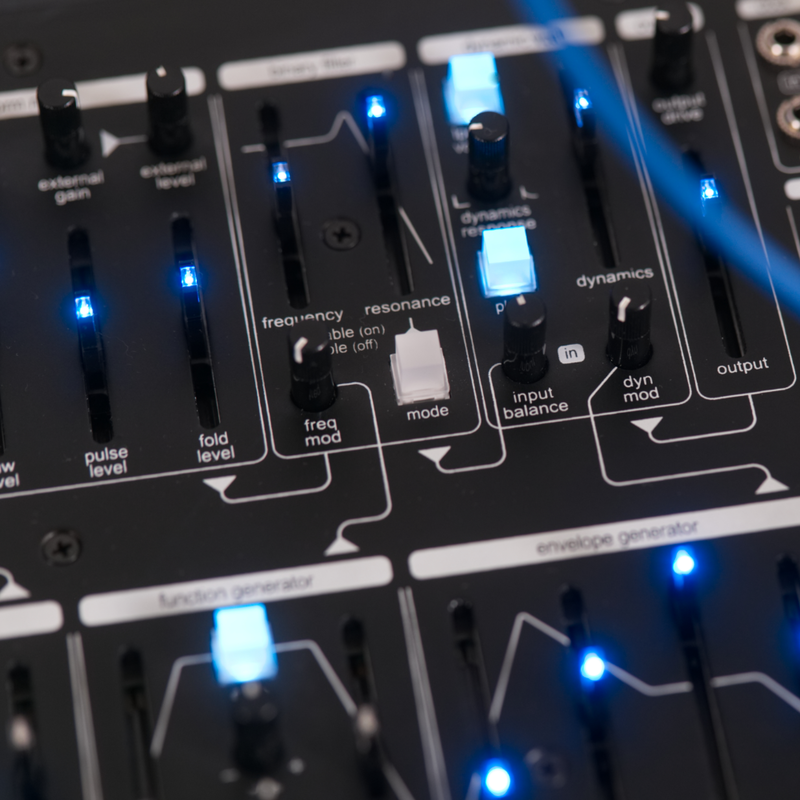 The Pittsburgh Modular Microvolt 3900 takes a new approach to building a raw, analog monosynth with a host of unconventional and inspirational features. Patch cables optional. With our new temperature stabilized, dual VCA oscillator core, the analog audio engine of the Microvolt 3900 feeds a set of timbrel waveshapers crafted for deep harmonic shaping, enabling a layer of additive synthesis alongside the classic subtractive synthesis waveforms. Waveforms are fed into our binary filter, a custom state variable filter architecture offering near infinite resonance with or without self-oscillation. Sonically this creates a juicy, fluid filter adding depth and energy to the oscillator that can scream if you ask it to. The heart of the Microvolt 3900's sound is our new dynamic VCA technology. Where a standard VCA works in two dimensions, the Microvolt 3900 dynamic VCA technology adds a third dimension. As the dynamic VCA closes, decreasing the amplitude, harmonics are removed from the source. As the dynamic VCA opens, the harmonics are restored. This mimics the behavior of sounds in nature. The result is a lively, organic sounding synthesizer full of energy. The design of the dynamic VCA also allows the instrument to be plucked or struck, opening up another set of percussive musical possibilities. The Microvolt 3900 is patched internally and does not require patch cables to dial in a wide variety of unique and powerful sounds. For deeper experimentation, the Microvolt 3900 includes a 39-point eurorack format friendly 1/8" jack patchbay for complete signal routing control over a full complement of audio and modulation options. 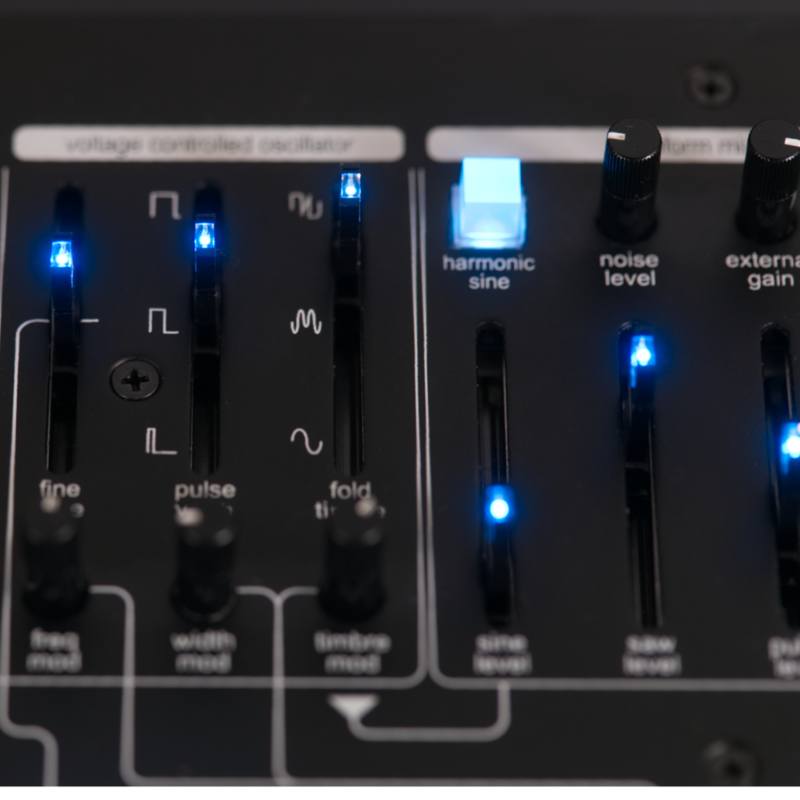 A four-stage envelope generator, multi-purpose function generator, wide range LFO, chaotic random source, arpeggiator, sequencer, and midi to CV control are also available to create dynamic sounds unique to the Microvolt 3900. Temperature stabilized, dual VCA based, analog saw core oscillator simultaneously outputting saw, sine, pulse, and folded waves. Modulation options include exponential frequency modulation, pulse width and fold timbre. The sine wave is capable of switching from a clean sine to a harmonically rich half rectified sine wave. Blend oscillator waveforms, analog noise, and preamp. The preamp uses a 30x soft clipping overdrive circuit to push external audio or internally patched feedback loops from mellow to monstrous. Based around the classic Pittsburgh filter circuit, the Binary filter in the Microvolt 3900 utilizes a smooth 2 pole, state variable core to create a buttery smooth frequency sweep paired with a new resonance circuit that slides from clean, gummy bubbles to a screaming, overdriving freakout. Organic and percussive, the dynamic VCA utilizes an entirely new, all analog design to replicate the impact transients and vibrance of a percussion hit. The result is a versatile VCA section that sounds natural and energetic. The dynamic VCA works in two modes: high quality VCA and a lowpass gate mode that manages both timbre and loudness at the same time. Output section uses a proprietary 30x symmetrical overdrive circuit for additional sound sculpting. Results can vary from subtle warmth to squared out, harmonic bliss. High quality stereo headphone amplifier and monophonic line level outputs controlled by a master volume slider. 128 note Midi to CV converter with assignable modulation output and variable pitch bend paired with a multi-mode arpeggiator. The arpeggiator offers as played, hold, transpose, multiple octave, random, and 16-step sequencing with rest and note repeat modes. Octave up and down buttons shift the frequency of the oscillator +/- 2 octaves. Balance control mixes a free running, wide range LFO with variable ramp and pulse waves with a complex random CV. The random section offers multiple modes from standard sample and hold type response to evolving six stage shift register pseudo random CV patterns. Multi-function, periodic control voltage generator can be used as a voltage controllable 2-stage attack/decay envelope generator, voltage controlled LFO, and voltage controlled oscillator. Perfect for modulating the filter or FM'ing the oscillator. A 4-stage envelope generator with independently adjustable attack, decay, sustain, and release stages. The ADSR shapes incoming gate signals to produce a more expressive instrument. The ADSR output can be used to control the amplitude of an oscillator, the cutoff frequency of a filter or any other voltage controlled function. An extension of the patch bay, this flexible circuit works as a +/- 5 volt CV source, signal attenuator/inverter, 2 channel audio or CV mixer, and audio or CV signal splitter. Override the internal wiring and unlock the unlimited audio and CV signal routing potential of the Microvolt 3900 for maximum creative control. 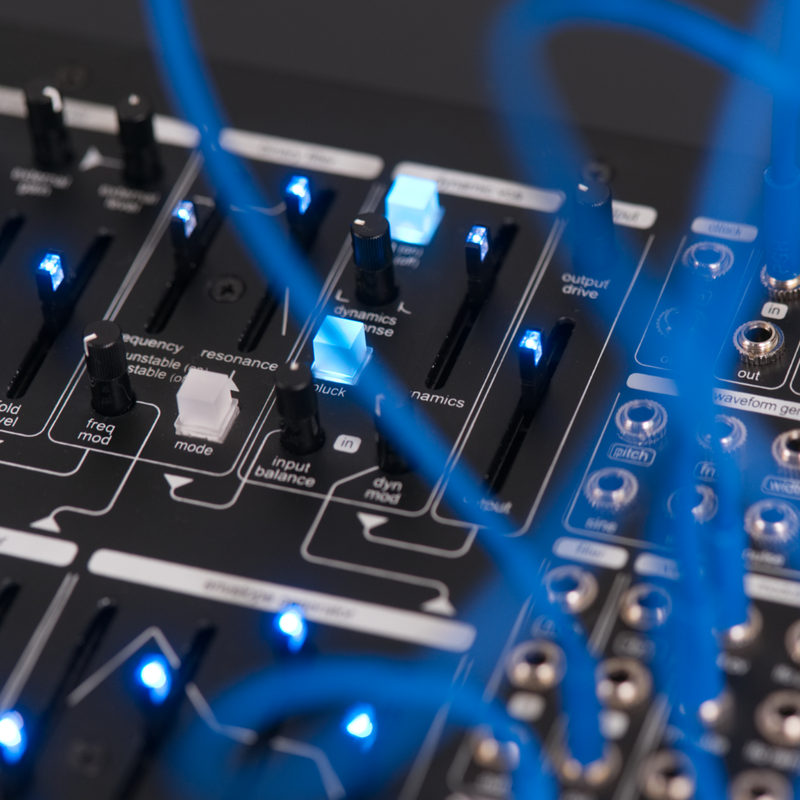 Fully modular patch bay allows almost every function of the Microvolt to be controlled with patch cables. Patch Cables: 5 Nazca Audio brand patch cables.